This post is kindly sponsored by Pereg Natural Foods. What happens when a celiac is on the hunt for the best gluten free pizza recipe and has some leftover sweet potato in her fridge? She comes up with the sweet potato pizza crust recipe of her gluten free and vegan dreams, of course! This sweet potato pizza is packed with fiber and antioxidants from the sweet potato and chia seeds. 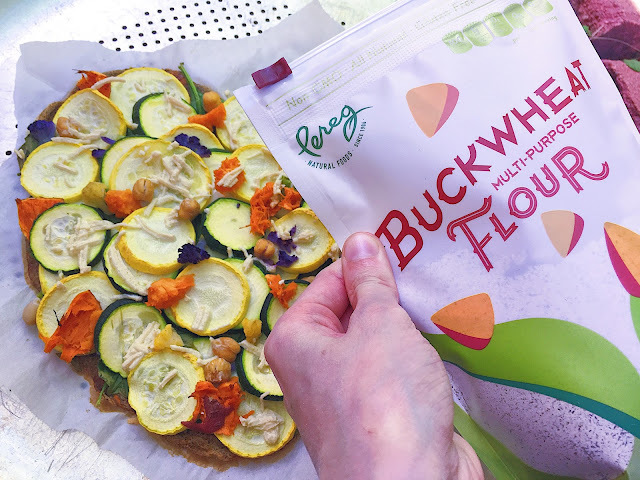 Thanks to Pereg Natural Food's All Purpose Buckwheat Flour, this gluten free pizza crust is also high in iron and offers some plant-based protein. The best part? The sweet potato pizza crust features only six ingredients (excluding water), making this one of the easiest personal pizza recipes out there! What about the texture of this gluten free pizza crust? This sweet potato pizza crust is chewy, hardy enough to be eaten with your hands and packed with sweet potato undertones that perfectly complement lots of veggie toppings and some creamy avocado on the side. Start by preheating the oven to 400 degrees Fahrenheit...and by making your chia egg, which needs around 10 minutes to gel! If you don't already have some, grind around one TBSP of chia seeds (in a coffee grinder or powerful blender) into powder. Add one TBSP of the ground chia seeds into a small bowl, followed by three TBSP of water. Mix thoroughly and set aside. Now, you need to get the sweet potato ready for your sweet potato pizza crust. 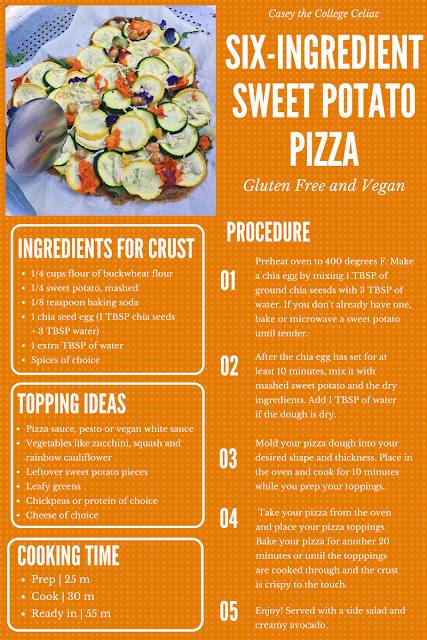 As I mentioned earlier, this is the perfect gluten free pizza recipe to use up leftover cooked sweet potatoes. If you don't have any leftovers on hand, though, you can use store-bought potato puree or cook your own. Just poke your sweet potato thoroughly with a fork and microwave (or bake) it until tender. Once cooked, transfer one-fourth of the sweet potato to a bowl and get mashing! I kept the skin on and shredded it, but you can also just use the insides of the sweet potato. Done mashing and shredding your 'tater? Add your chia egg (which should have formed a thick, jello-like consistency) and the dry ingredients. Mix well with a fork. If your vegan pizza dough seems too dry (which mine did), add one TBSP of water. By the end, you should have a thick, slightly sticky gluten free pizza dough! Now the fun part: shaping your sweet potato pizza crust! My secret is using a piece of plastic wrap to shape my pizza dough on parchment paper, keeping my hands nice and clean! I prefer a thin gluten free pizza crust, so I spread my dough (into the shape of a heart!) until it was around an eighth of an inch thick. For a thicker vegan pizza crust, just leave your dough more compact. Once your pizza is properly shaped, sprinkle on a little more spices and pop it in the oven. You'll bake your sweet potato pizza crust for around 30 minutes total. How you split up the time depends on your toppings. Want to add lots of uncooked veggies like I did? Pull out your crust after ten minutes, or when it's still a bit soft but no longer sticky. Because the sweet potato pizza crust already has an earthy, slightly sweet flavor, I left my pizza sauce-less. 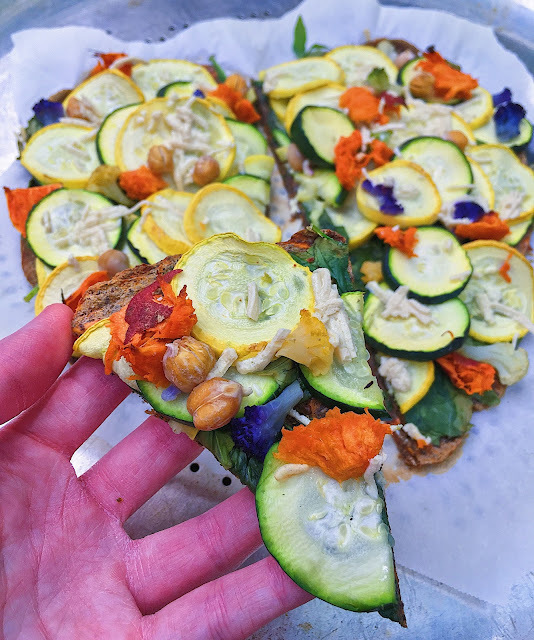 I just stacked shredded spinach, sliced zucchini, squash, rainbow cauliflower, chickpeas, some extra dollups and sweet potato and a sprinkle of Daiya cheese. Then, I baked my sweet potato pizza for another 20 minutes, or until the veggies were cooked through and the crust felt a little crispy on the edges. If you're adding minimal or pre-cooked toppings, bake the crust on its own for around 15 minutes. Then, add your toppings and put your sweet potato pizza back in the oven for another 15 minutes or until cooked through. After your gluten free pizza is done, you can dig in! I served mine with a side salad, steamed green beans and some super creamy avocado. Love this gluten free recipe? Tweet it out by clicking here: "#Glutenfree and #vegan pizza just got an upgrade w/ this six-ingredient #sweetpotato crust! http://bit.ly/2rGtNQc via @collegeceliackc"
This sweet potato pizza crust would also make an EPIC brunch if you topped it with an egg (or scrambled tofu, for a vegan option), avocado and salsa. The pizza possibilities are endless, so do what you need to do to make this the best gluten free pizza crust for you! Regular readers of this blog probably know that I don't fool around when it comes to sweet potatoes and gluten free pizza...and this sweet potato pizza recipe proves it. Healthy? Check. Allergy-friendly? Check. Way more delicious than people ever expect with gluten free and vegan food? Check! Now, it's your turn to check out this sweet potato pizza crust...and check "eat an epic gluten free pizza" off your bucket list! What are your favorite pizza toppings? Have you ever heard of Pereg Foods? Tell me your thoughts in the comments!